All teachers work to get their students under control at their desks so that they can focus on school. Using exercise balls instead of chairs can help with getting the wiggles out. Students who slouch in their chairs or even doze during lessons can change dramatically after sitting on stability balls for several weeks. The plastic exercise balls were first developed in the 1960s for physical therapy but have since been used in gym workouts to rev up traditional push-ups, sit-ups or yoga moves. The idea is for the ball’s instability to improve a user’s own stability, coordination and posture. The same concept seems to work with a growing number of schoolchildren across the country, according to research, but with an added benefit — it keeps kids engaged during class. Youth spend from first grade, to college and university looking at the back of someone’s head and a ball allows for much better range of motion with your neighbors. Replacing students’ desk chairs with stability balls leads to most preferring ball-chairs. They kids will improve posture and will have better attention levels. 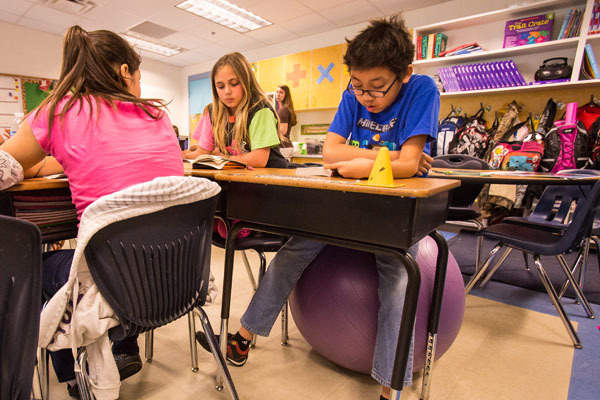 More recent research conducted by educators and medical researchers in Aroostook County, Maine, schools found 78 percent of teachers said handwriting improved in students who used stability balls instead of desk chairs. Students were also less squirmy and even improved or maintained test scores, according to the study. Other research from the University of Kentucky in 2011 suggests the balls can have a “dramatic effect” on students with attention and hyperactivity problems.